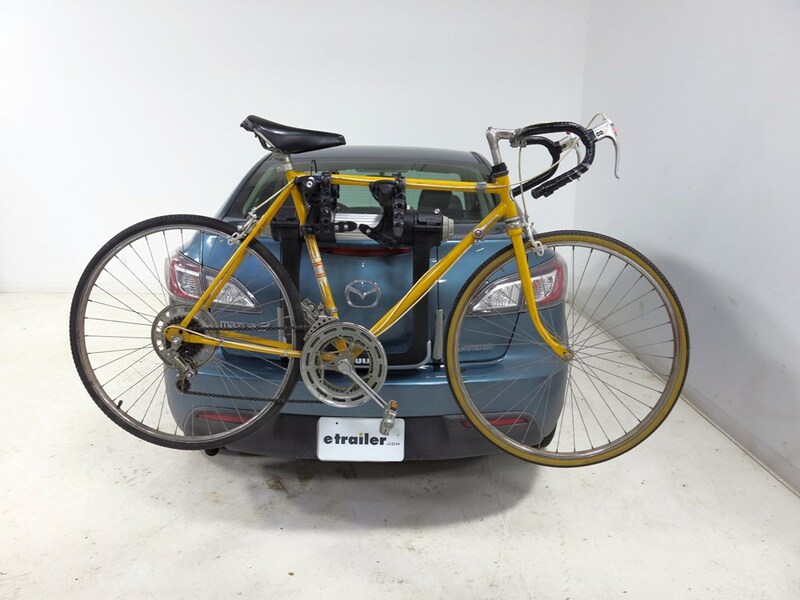 The best technical support and full trunk bike racks installation instructions. 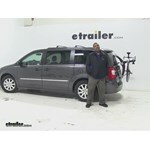 Lowest price Grand Caravan trunk bike racks guarantee and expert service. 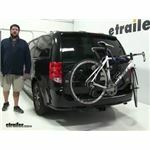 Dodge Grand Caravan, 2005 trunk bike racks by Thule are available from etrailer.com. 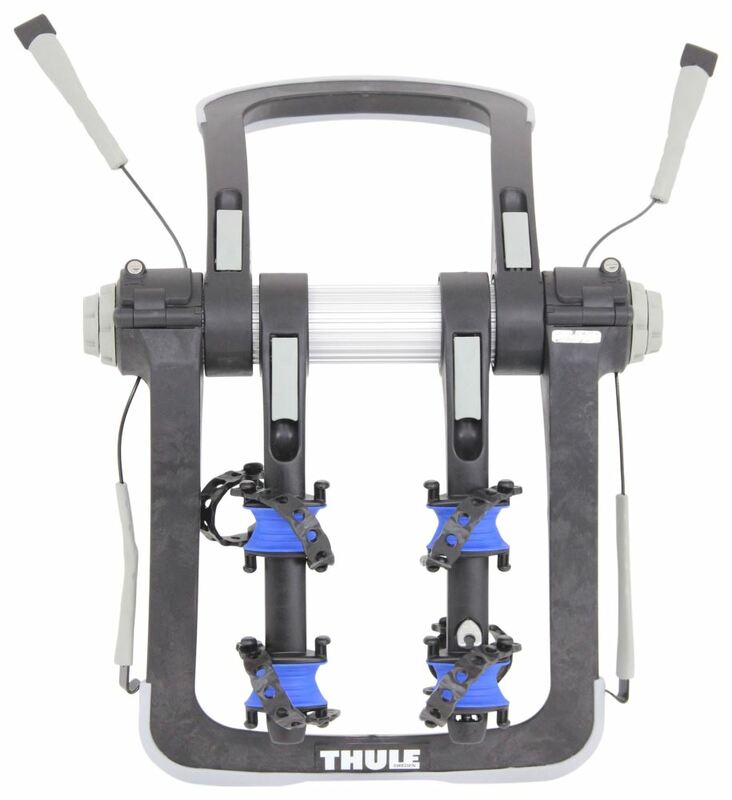 For expert service call 800-298-8924 to order your Thule Raceway PRO 2-Bike Rack - Trunk Mount - Adjustable Arms part number TH9001PRO, or order online at etrailer.com. This trunk-mounted bike rack has premium RDT anti-sway cradles, adjustable arms for level bike transport, and the patented FitDial system with ratcheting cables for easy setup on your Dodge Grand Caravan. 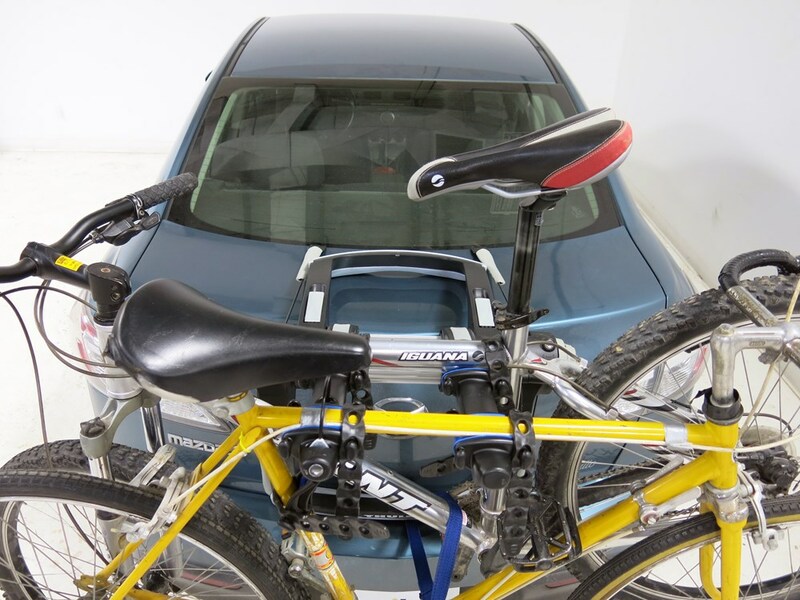 Integrated locks secure bike to rack and rack to car. 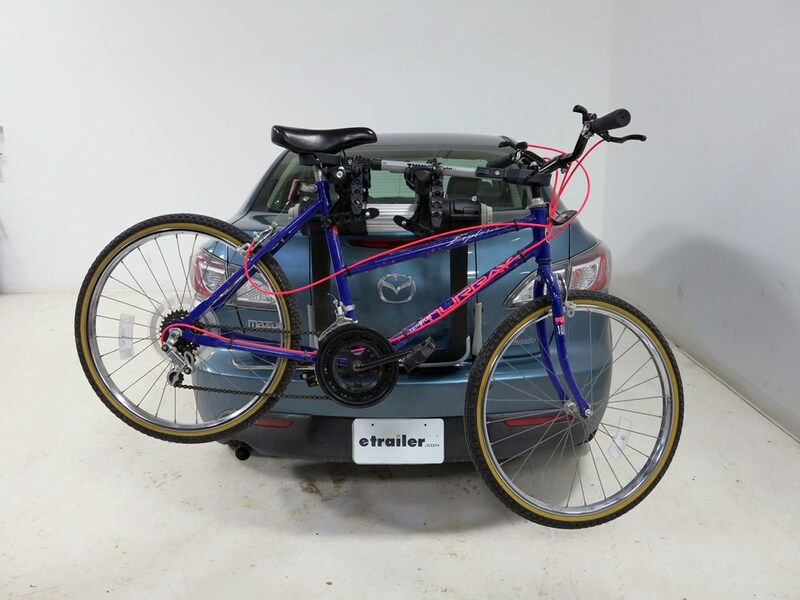 Distance between arms (outside cradle to outside cradle): 6-1/2" - 10-1/2"
The Raceway PRO trunk-mounted bike rack lets you carry 2 bikes on the back of your vehicle with no hassle and plenty of style. 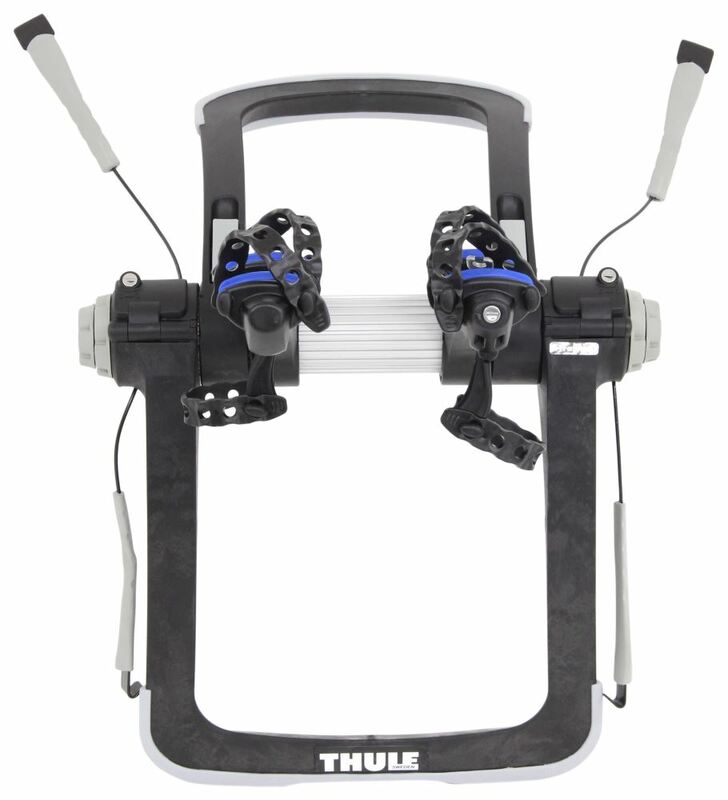 The rack sets up in minutes with Thule's patented FitDial system, and your bikes ride on shock-absorbing anti-sway cradles engineered to cushion and grip the frames. 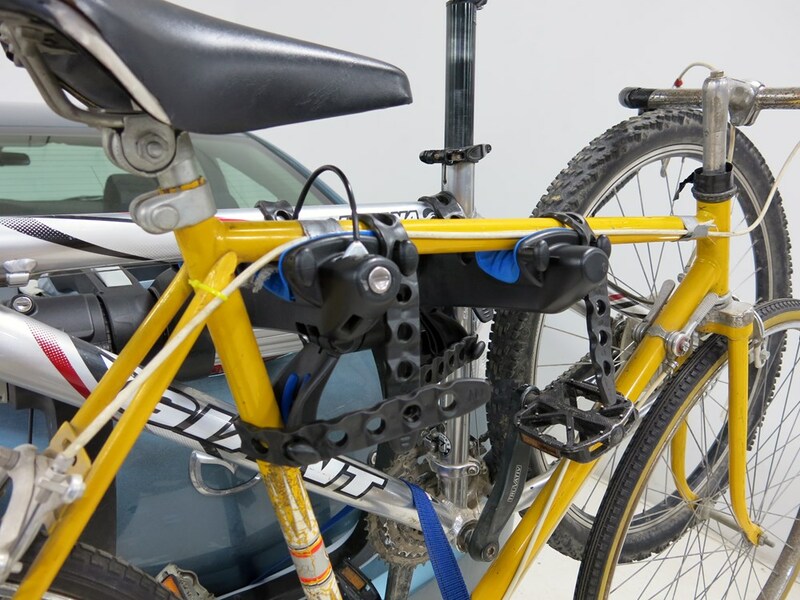 For added peace of mind, the rack includes One-Key System lock cylinders that allow you to secure your bikes to the rack and the rack to your vehicle. The Raceway PRO's Hold Fast anti-sway cradles are steeply curved to hold your bikes in place, and they include thermoplastic elastomer (TPE) cushions with road dampening technology (RDT). The stretchy, gel-like TPE layer absorbs road shock and minimizes vibration to reduce stress on your bike frames during transport. Removable No-Sway cages grip your bikes by the downtubes to prevent sway, front-to-back movement, and bike-to-bike contact. TPE strips on each cage cushion your bike frames and protect them from scratches and scuff marks. 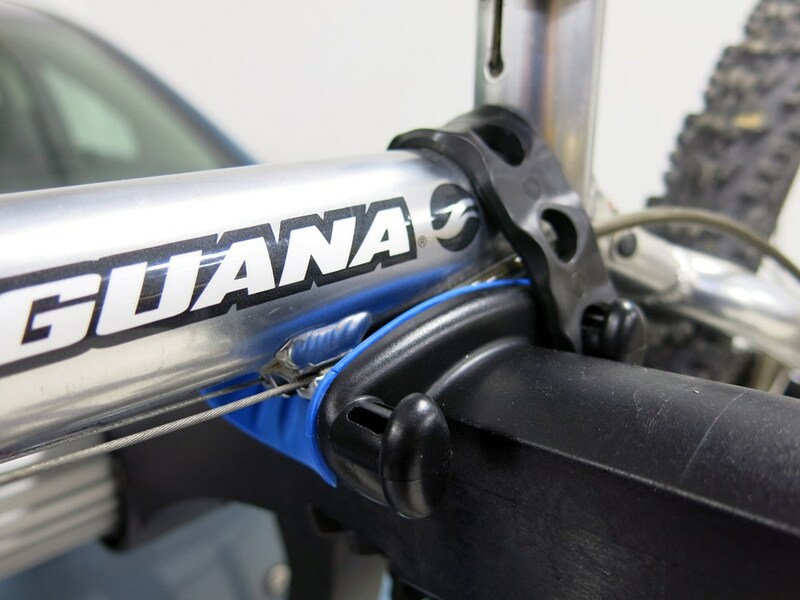 Strong, flexible TPE straps wrap around your bike frames and hold them firmly in the cradles. Reinforced attachment holes maximize hold and durability. The Raceway PRO uses Thule's patented FitDial system to ensure a snug fit on your vehicle and to make installation a snap. The included instructions indicate which FitDial number is right for your vehicle. To set the rack up, simply lift the center levers, adjust the base until the arrow lines up with the right number, and close the levers to lock in your setting. 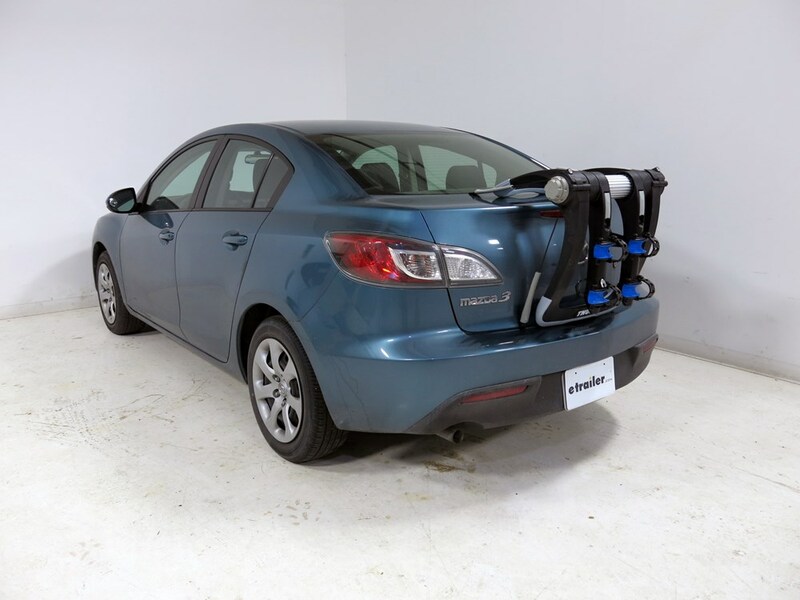 The rack base opens and closes like a clamshell, so it fits snugly on just about any trunk or rear hatch, and it clears many factory spoilers. 4 Sure-Tight braided steel cables with coated hooks attach the rack firmly to your vehicle's trunk or rear hatch. These cables won't fatigue over time like nylon straps, and they're a lot more difficult to cut than nylon straps. 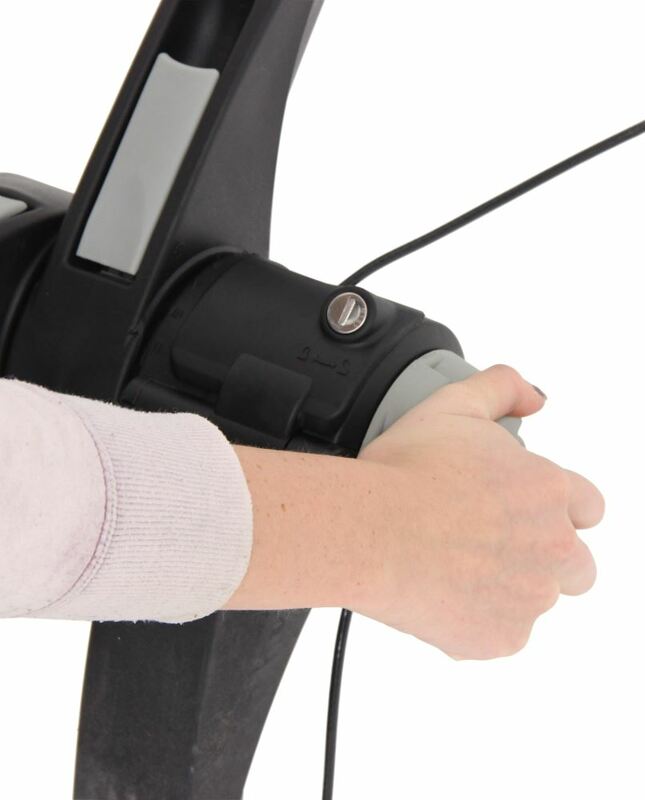 Oversize ratcheting knobs let you precisely tighten each cable. 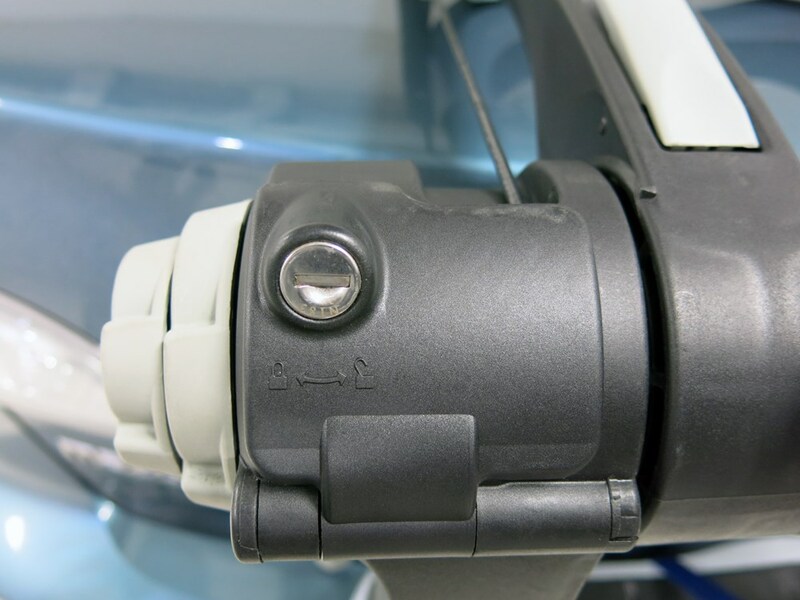 To secure the rack to your vehicle, simply pull up on the release levers to deploy the cables. With the hooks in place on your trunk, turn the ratcheting knobs to tighten the cables until the rack is snug against your vehicle. 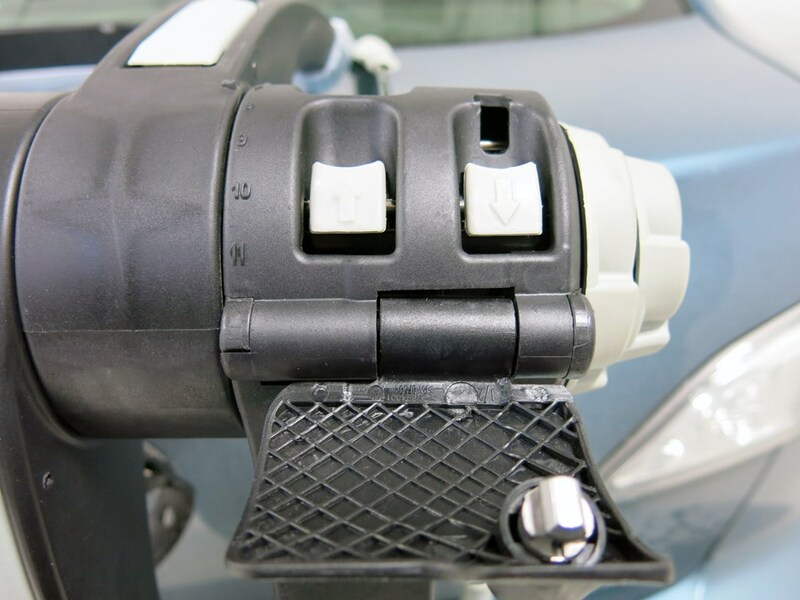 The Sure-Tight cables and hooks are coated with durable nylon, and the cables have movable sleeves that help protect your vehicle's paint from scuffs and scratches. Contoured TPE pads on the rack's upper and lower bases grip your trunk or rear hatch to keep the rack firmly in place during transport. 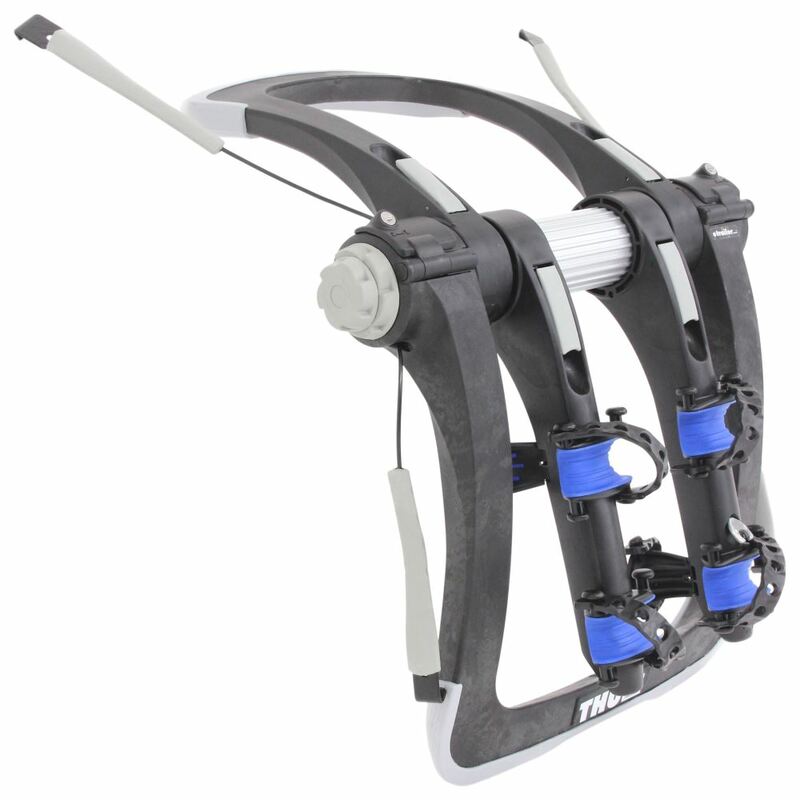 The Raceway PRO has adjustable dual arms that provide excellent bike support and make loading and unloading your bikes easy. The arms adjust up and down and side to side, independent of the base and each other. To adjust an arm, simply pull the arm lever, move the arm to the desired position, and close the lever. These levers also let you fold the arms down for storage. Adjusting the arms up and down ensures that your bikes are level during transport and helps to provide adequate ground clearance. 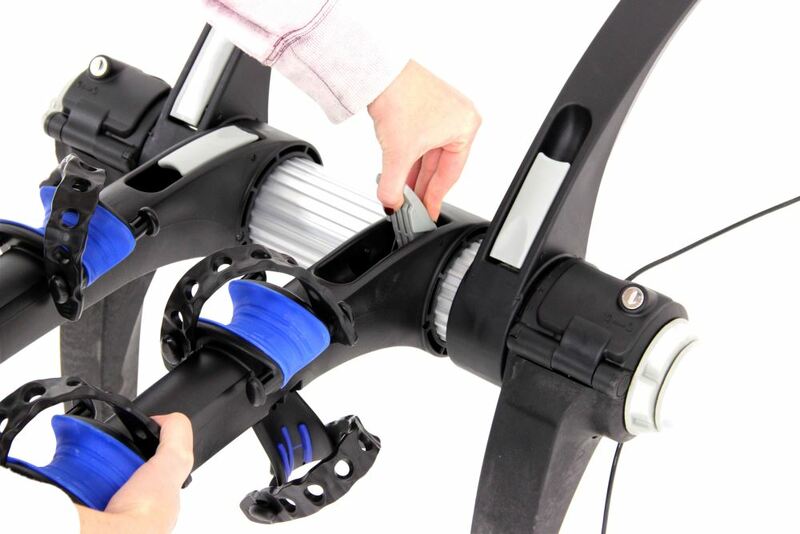 Adjusting the space between the dual arms aids in bike loading, and it allows the rack to carry a wide variety of bike styles, including children's and alternative frames. 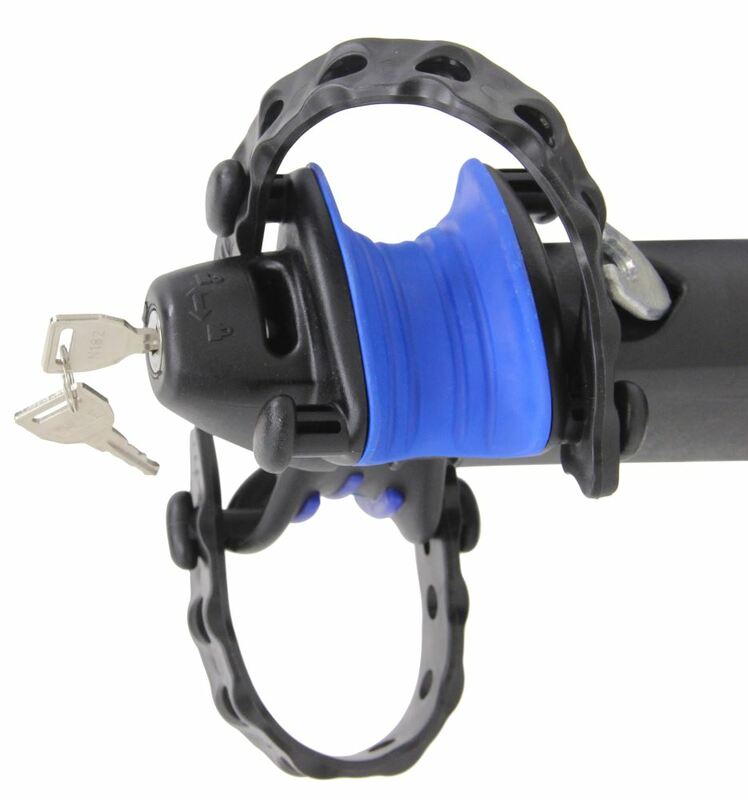 The Raceway PRO has an integrated cable lock that secures the outermost bike to the rack. And the release lever covers lock so you can secure the rack to your vehicle. Since you cannot release the cables without pressing the levers, the locking covers offer an effective anti-theft device for the rack. 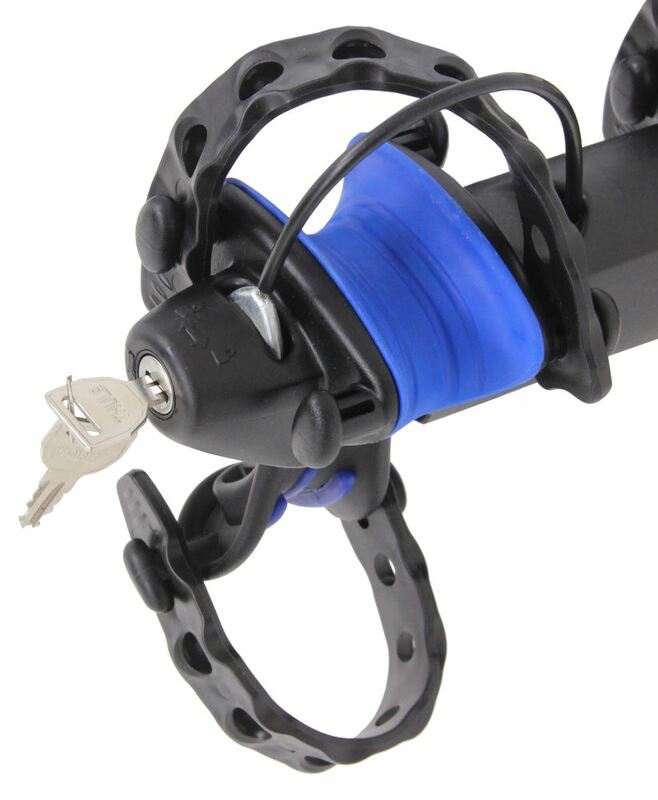 The cable lock and the locking covers have One-Key System cylinders that are keyed alike so you only need a single key for the rack. One-Key System lock cylinders can be swapped out if you own other Thule products and want to use the same key to lock them all. The rack folds flat for compact storage in your trunk or garage. Simply open the center levers, fold up the rack, and close the levers to lock it in the closed position. 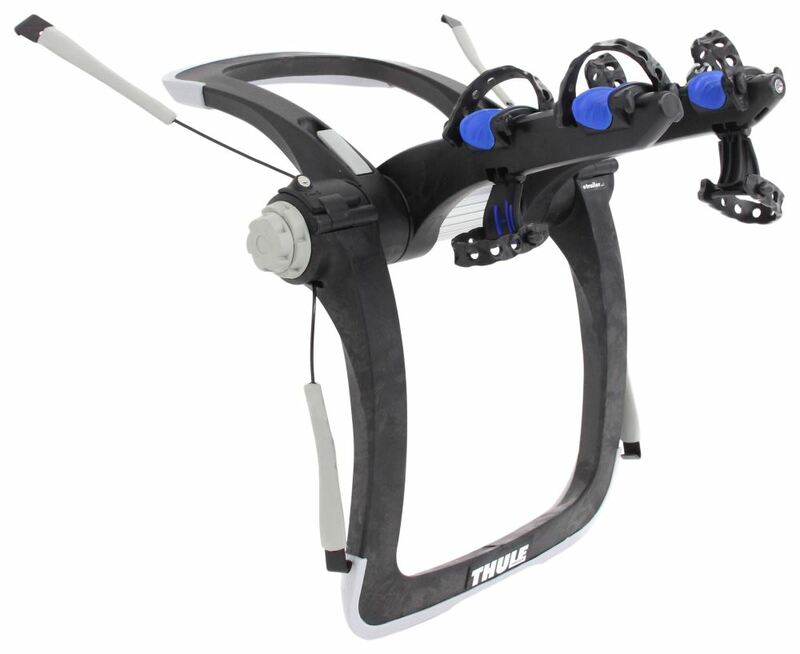 Today we're going to be reviewing the Thule Raceway Pro, 2-Bike, Trunk Mounted Bike Rack, part number TH9001PRO. 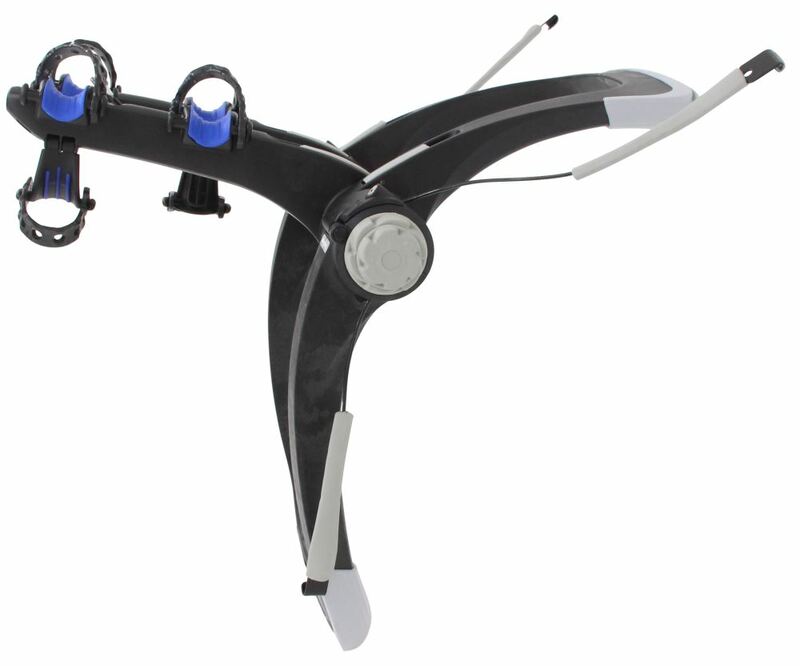 This is also available as a 3-bike rack with part number TH9002PRO. The Thule Raceway has a lot of unique features, we're going to start out with how it fits on the vehicle. It has these nice rubber padded protectors as well as the vinyl coated hooks so it's going to protect the paint and finish on our vehicle. Right here in the cradles, it's RDT technology, this is going to be Road Damping Technology providing a nice cushion ride for your bicycle. 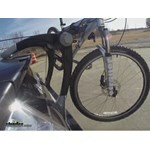 It's also going to feature your anti-sway cradles so your bikes don't make contact with one another. 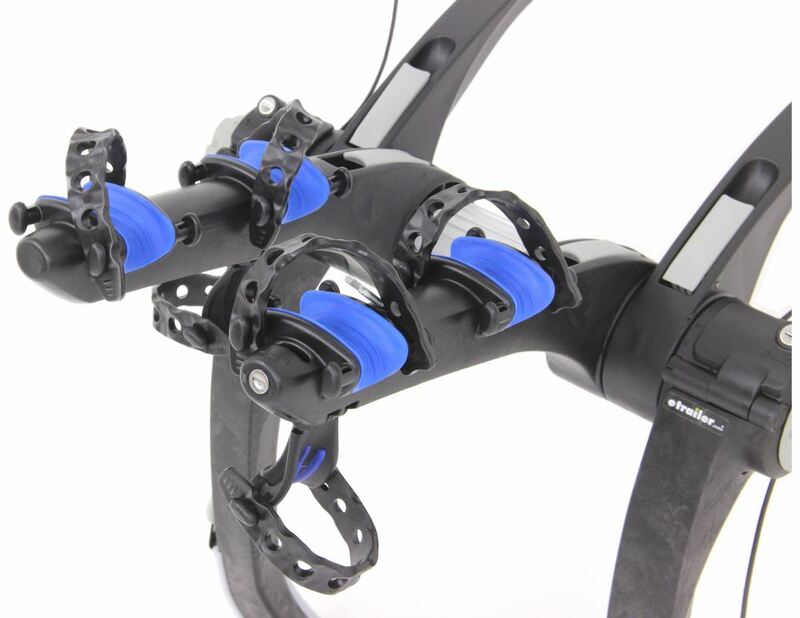 It's got the fully adjustable arms that way you can scoot them closer together, separate them, you can also change the angle so it's going to fit a wide variety of bikes. Right here you're going to notice that it has the patented fit dial system so it's also going to fit a wide variety of vehicles. There going to be a lock located on each end of the bike rack. These locks are lock the rack to the vehicle for full security. Here on the end of one of the arms, we're going to find a cable lock system so not only does your rack lock and secure to your vehicle but it's also going to lock your bikes to the rack. It's going to use the same key system so any of the keys provided will work on any of the locks on the rack. 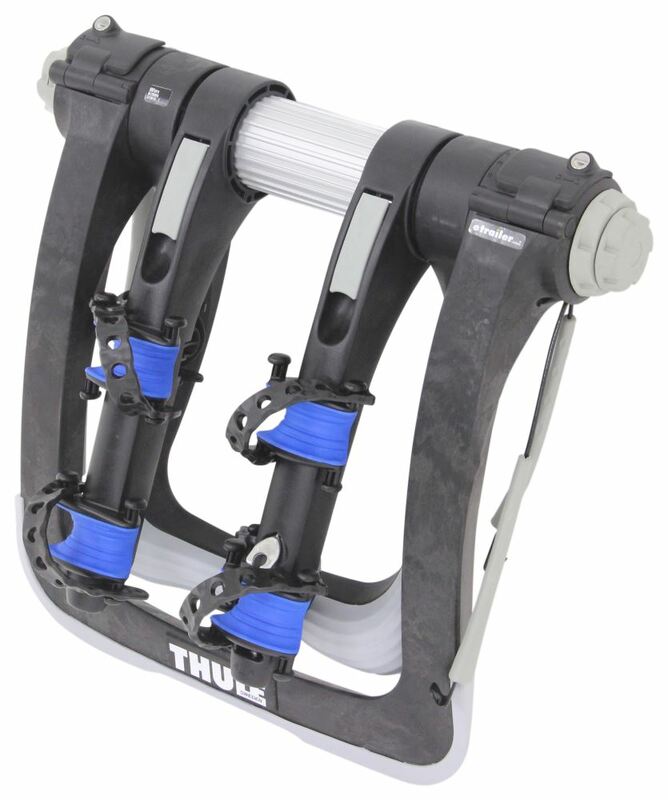 The Thule Raceway is constructed of a gas injected molded nylon which makes it very strong and durable but yet light-weight. This bike rack has the carrying capacity of two bikes with the weight capacity of 70 pounds. The distance between the adjustable arms, from outside cradle to outside cradle, can range from 6 1/2 inches to 10 1/2 inches. 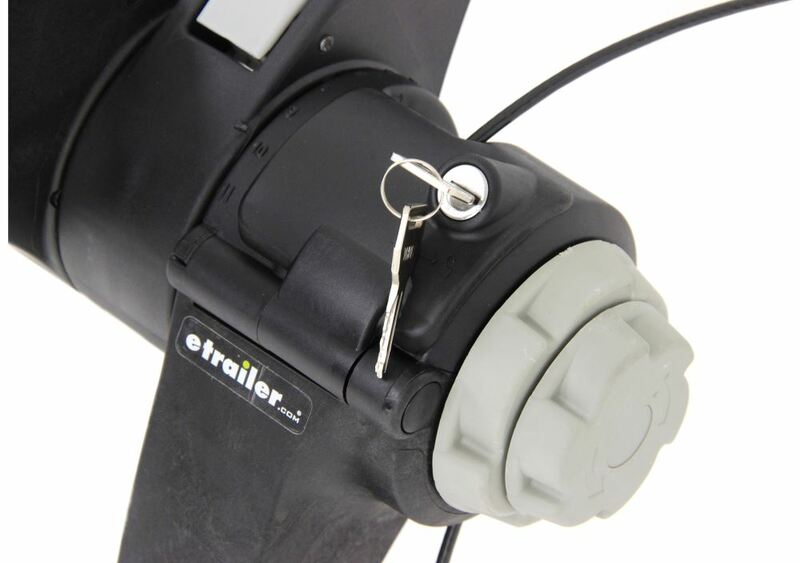 Now when loading up a woman's bike, alternative frame bike or a children's bike, you may need to use the Thule Bike Adapter Bar that's available right here at etrailer.com, sold separately with part number TH982XT. Now we're going to show you how to install the Raceway on your vehicle. As you can see it folds up nice and compact for easy and convenient storage. Now you want to refer to the Thule Fit Guide, you can either use our website or they're going to include a fit guide in the instructions. It's going to show you how you need to adjust your arms and where your arms need to be sitting in relation to your particular vehicle. On ours today, we need to go ahead and set our fit dial to the appropriate number, once we have it set, we can close these tabs right here, it's going to lock that upper arm in place. Now for our particular fit, our upper arm needs to sit here on top of the trunk and then our lower arm needs to seating on the upper tier of our bumper. Now we did go ahead and clean our surface so you want to make sure you do that before installing this. Once we have this situated correctly on our trunk, the next thing to do will be to go ahead and place our hooks. Now these have the nice protectors right here that way it protects the cable but mainly it's going to protect the finish on your vehicle. To adjust the cable, to get the hook in the proper place, we need to open up this cover here, place one of the four included keys in there, move it to an unlock position and then lower the hatch door there. You can see that we have an arrow pointing up that's going to indicate this cable here, pull that back, it's going to allow it to extend out and then we can place the vinyl coated hook directly into that gap right there on our trunk. We're going to use the ratcheting side handle to just get that line snug for now that why we can position the other three cables. Now we need to place our bottom hooks. To do so, we're going to repeat the same process, flip up on this lever here, it's going to allow us to gain some slack in the cable. Now in some applications, you're going to have to open the trunk in order to get the hook to fit. For ours today, we found out that we can go to the side of our trunk and get the hook to fit in there and then just slide it to where it needs to be positioned. Once we have it there, we can use the larger dial to operate the lower cable. I'm just going to tighten in up and remove any slack. With our rack in place, we can go and fine tune it, make sure everything is nice and tight and secure and then we can close these locking covers. Now once these are locked in place, you can see how that cover cannot be removed so that nobody can gain access to those little levers, loosen up the cables to remove it from our rack. It's fully locked on there and secured. 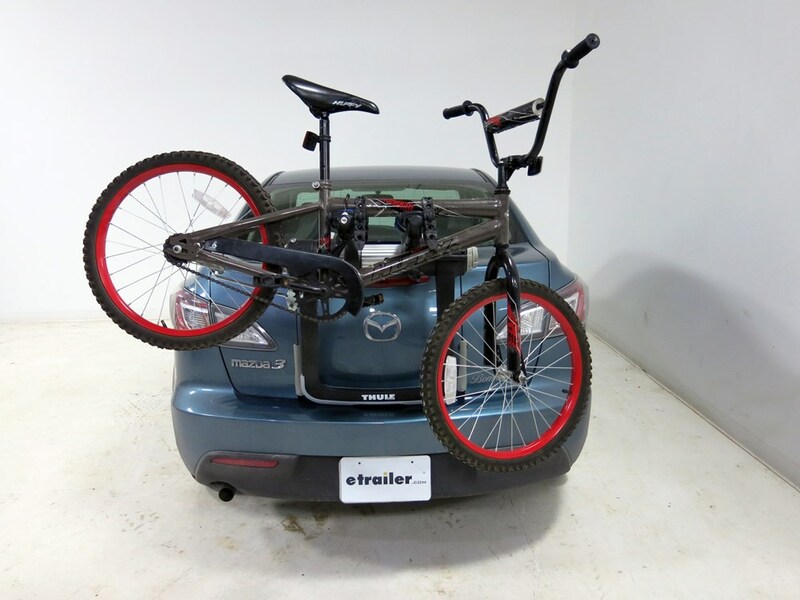 The Thule Raceway can stay on your vehicle even when you don't have any bikes installed. You just want to make sure that your arms are in a down position. Now we're ready to load up our bike. First thing we need to do, open up the lever to allow us to adjust our arms as needed. Now we want to make sure that our arms are level or slightly inclined. Once we have it set to the correct position, all we got to do is close that lever and that arm is going to be secured in place. Now the next step to loading our bike is to undo the cradle straps. It's going to open up our cradles, allowing them to receive the frame of our bike once we have it placed in there. Now we're ready to load up one of our bikes. We're simply just going to take it, place it onto our frame cradles, now if you come in here you can see that these have little grooves in it that's to accommodate if we have any cables mounted underneath the frame. Once we have that in place, we can simply bring our straps over and tighten them down around the frame of our bike. Go and secure the anti-sway. It's going to prevent the bikes from swaying back and forth making contact with one another. Now with the second bike loaded, we can bring our cable lock system over the frame on our bike, place into the groove right there, lock into place that's going to keep anybody from being able to take this bike off the rack which if you can't this bike off the rack, you're not going to be able to get your first bike off the rack either. 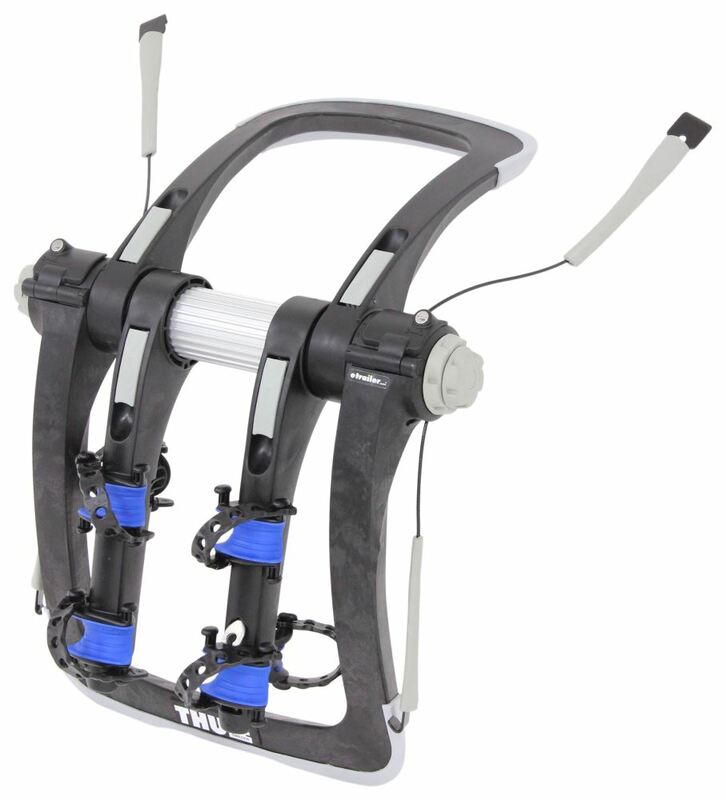 Now Thule also includes a nice blue strap, this can be intertwined through the bikes' frames and the bikes' wheels that way it's going to ensure that your bike wheels don't rotate, twist and turn as you're going down the road. Really simple installation, all we're going to do is take it through the wheels here on our bike, we're going to run it through both bikes. Simply take it through the other wheels as well and then we're just going to connect it to itself. 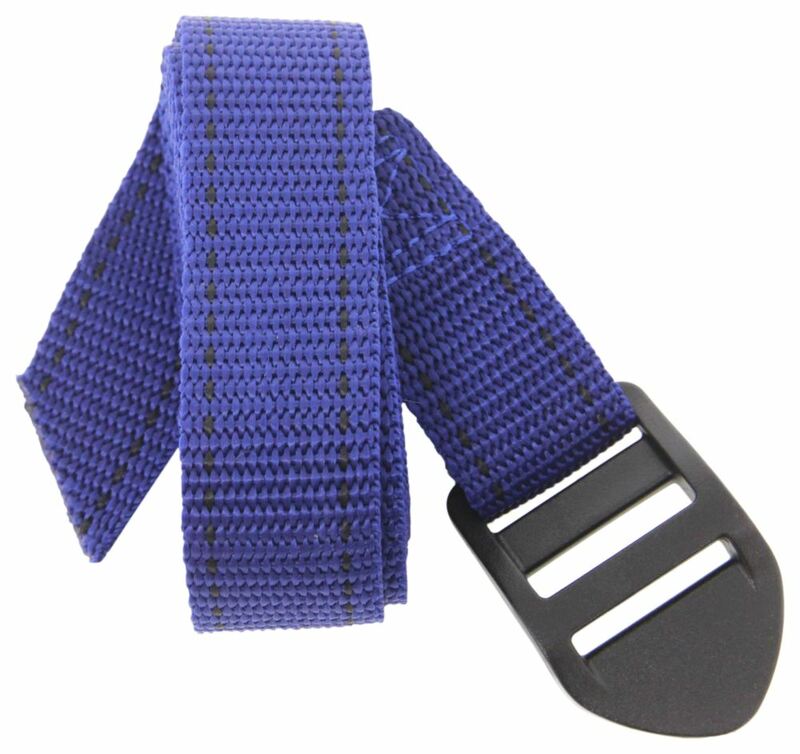 Once we have that strap ran through the buckle, we simply just pull on one end, take out any slack within the strap. 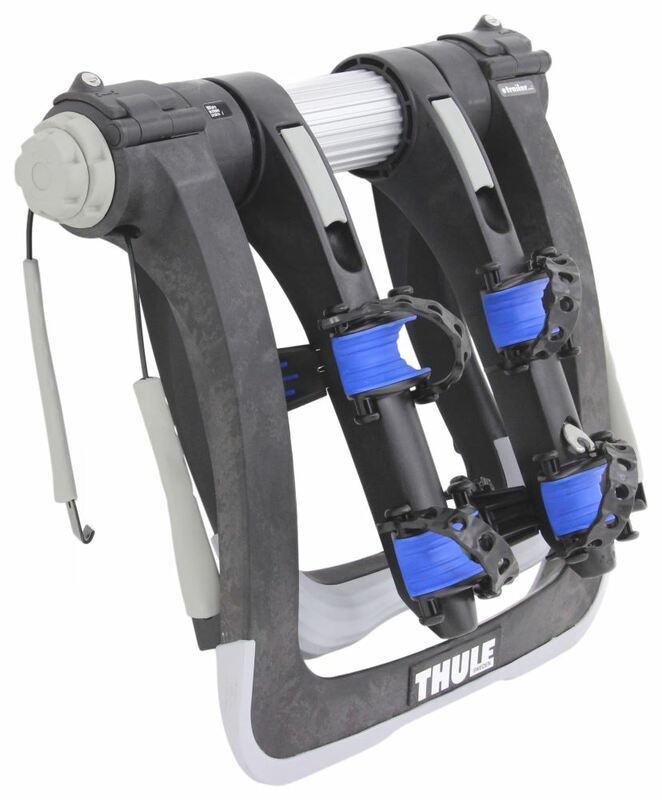 Now another option for attaching the blue strap is to run it through that lower frame on the Thule Raceway, through the bike frames and simply just run it through the strap. 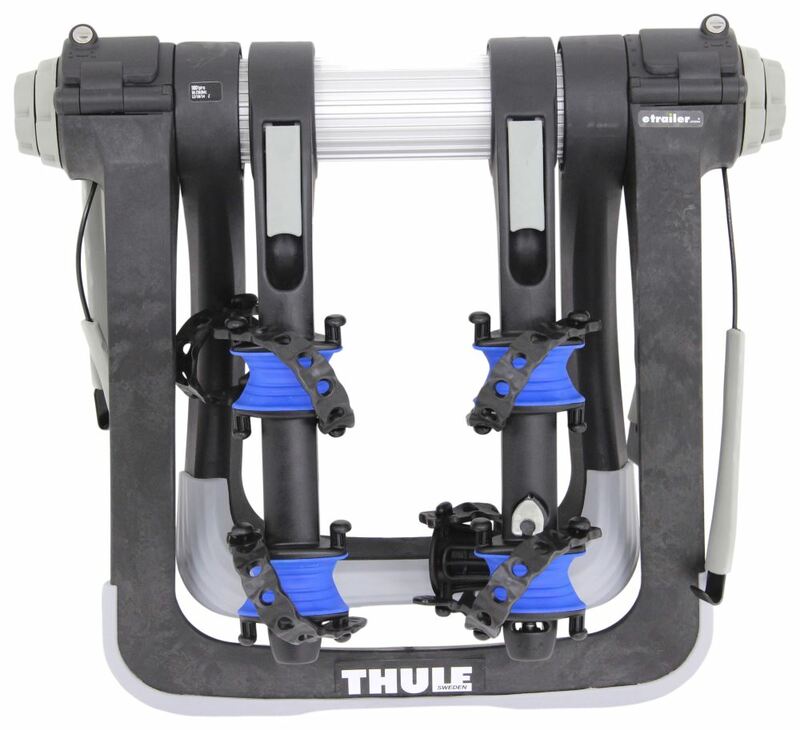 You've got numerous ways on which you can install the blue strap that Thule provides. Just keep in mind that it's meant for additional security. Now that we've gone over the features of the bike rack and showed you how to install it, we'll go ahead and take it out on our test course and show you how it performed in action. First, we're going to hit our slalom course, this is going to show you the side to side movement of the bike rack which simulates evasive maneuvering or having to make sharp turns or corners. Then we're going to hit the alternating bumps course, this is going to show you the twisting action of the bike rack which will simulate going over uneven pavement or hitting a pothole. Finally, we're going to take it through the solid bumps course, this is going to show you the up and down movement of the bike rack which is going to simulate going in and out of your driveway or going over a speed bump. 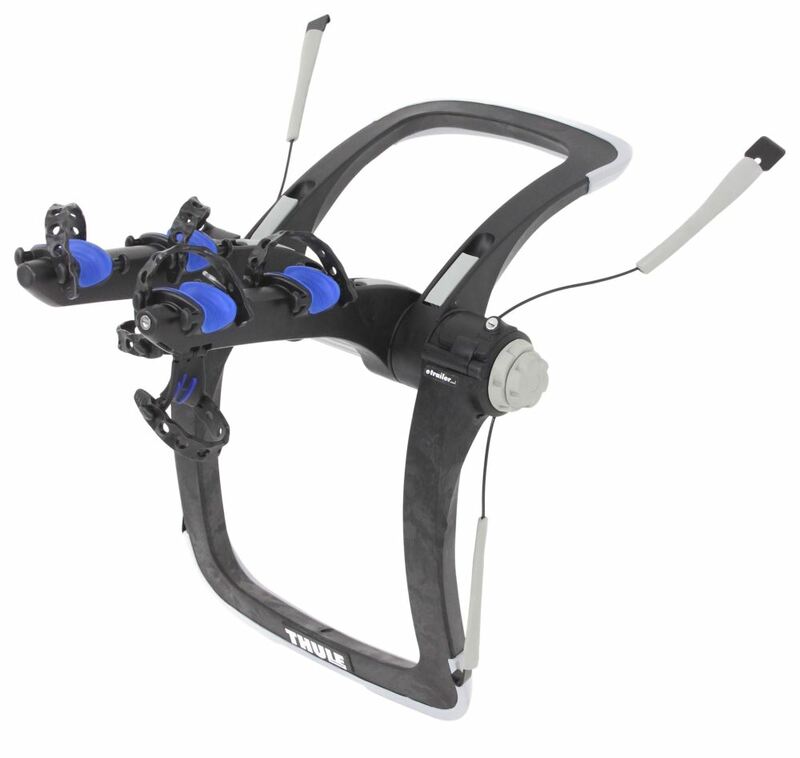 That's going to complete today's review of the the Thule Raceway Pro, Trunk Mounted 2-Bike Rack, part number TH9001PRO. .
Order: RelevanceNewestRating - High to LowRating - Low to High This trunk-mounted bike rack has premium RDT anti-sway cradles, adjustable arms for level bike transport, and the patented FitDial system with ratcheting cables for easy setup on your vehicle. 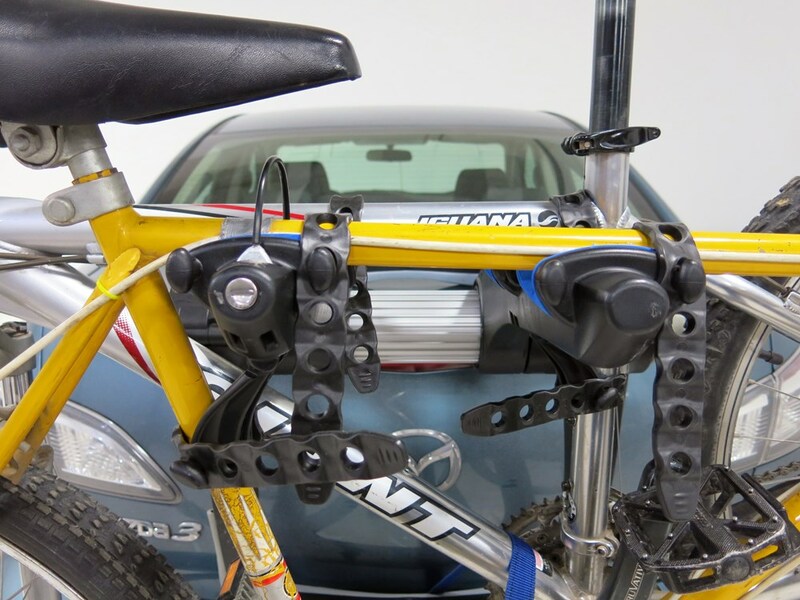 Integrated locks secure bike to rack and rack to car. Will this fit a 1998 BMW 328I Convertible and a 2013 Toyota Highlander? ?My wife has a ladies bike. Will this work for her bike? The rack will not work with the convertible. Because of the convertible and where it folds down, there is not a good place to secure the top straps. 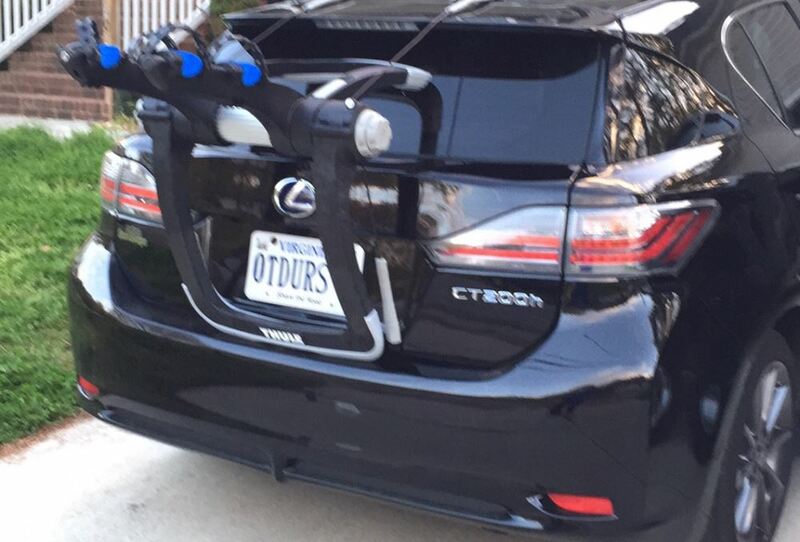 Thule also does not list it as a fit for the Highlander. What you could do is a hitch mounted setup for both. For the BMW, Curt hitch C11177 would work. For the Highlander, Curt Hitch 13534. With a hitch on each vehicle, you can use a hitch mounted rack. I have added a link to all the racks that will fit with both of those hitches. 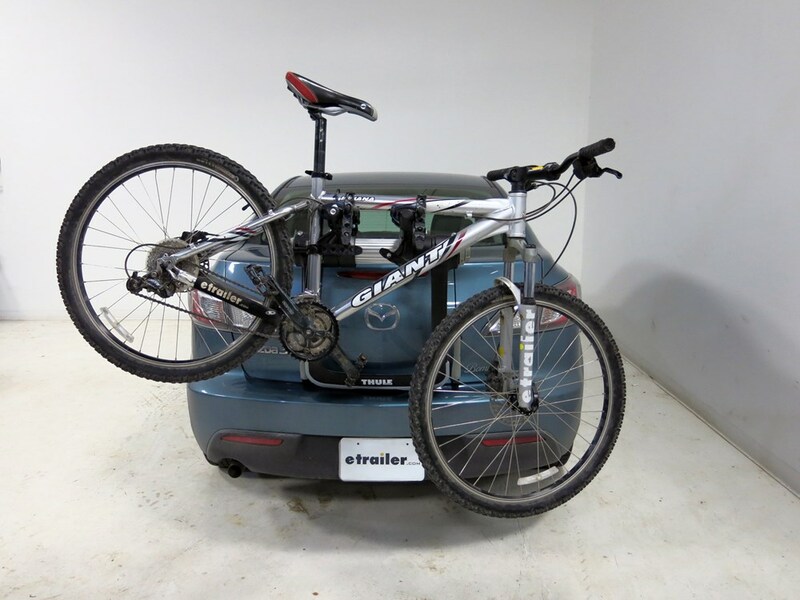 You could also look into roof racks with the Highlander, but that would not help with the BMW convertible. ***Update***etrailer.com recommended using the Yakima adapter bar and it works much better, allowing proper fit and use of the anti-sway bar. Their customer service was fantastic! 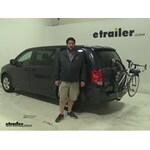 Thanks etrailer.com!! Thanks for coming back to update us! One year later- An Update: Found that the anti-sway rocker cradles which fit vertically tend to bend. 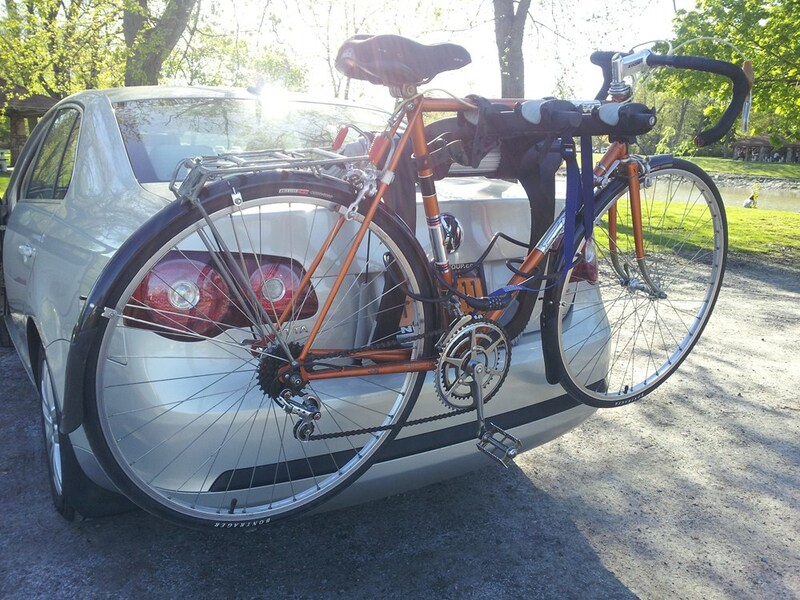 I had used the rack for a trip from Metro Detroit to Ludington and back. 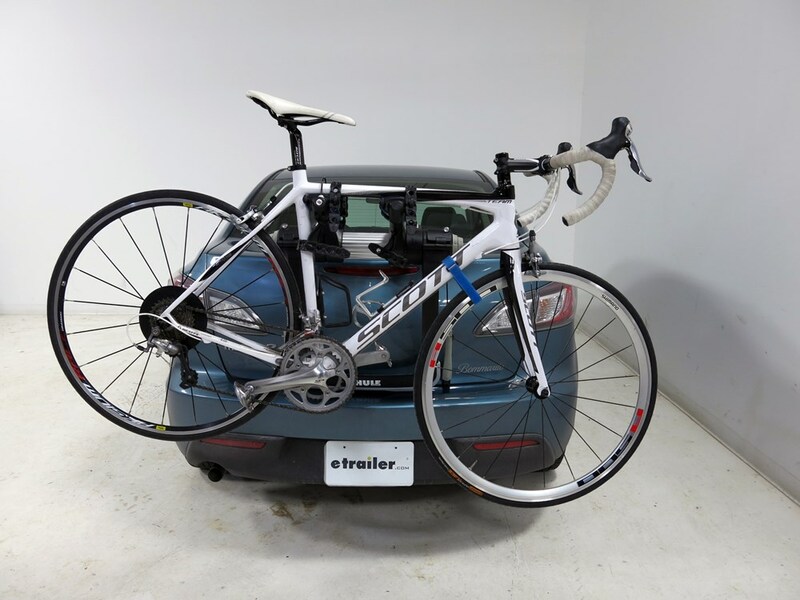 By the time I returned the vertical cradle was bent from the wind pulling the bike away from the trunk of the car. These guys replaced it. But Im not sure how to prevent it in the future. I am happy with this bike rack and do fee its very secure and stable. Im happy. Does this rack fit a 09 VW Beetle convertible? 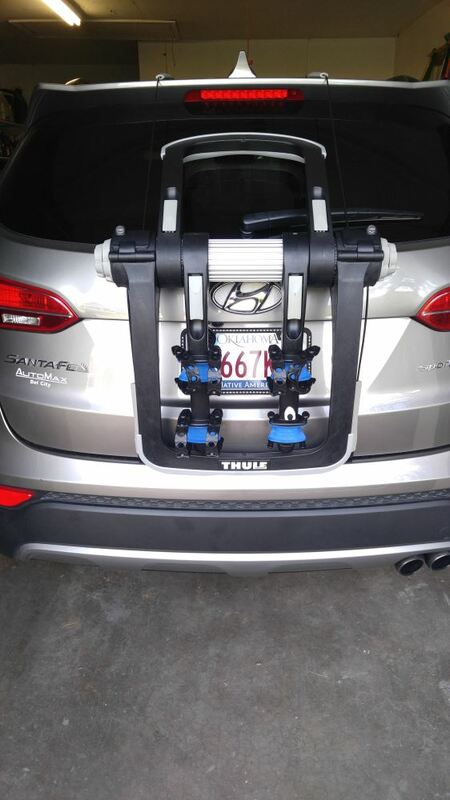 I checked with the Thule fit guide and this rack is not a fit. 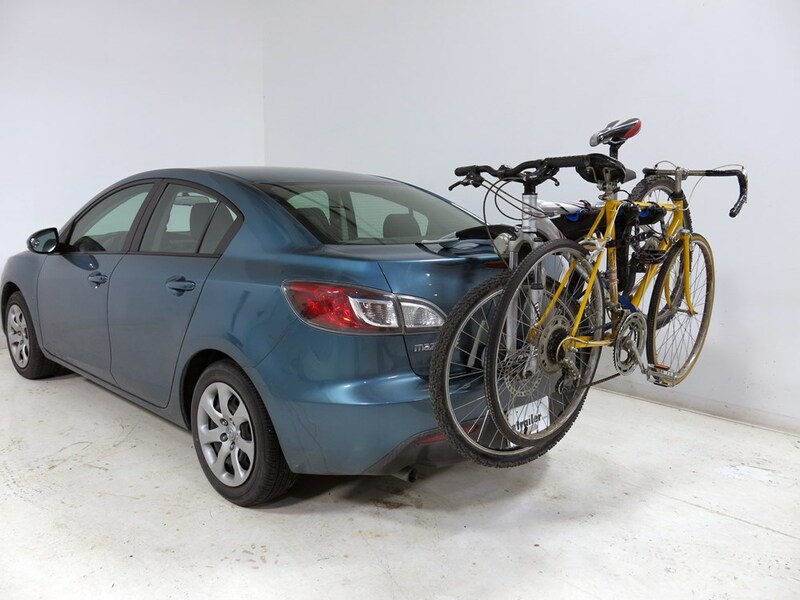 Thule states that the convertible is unable to support the weight of the rack and bikes safely. The story looks to be the same with Yakima. Your best bet would be to add a hitch to the Beetle Conv. 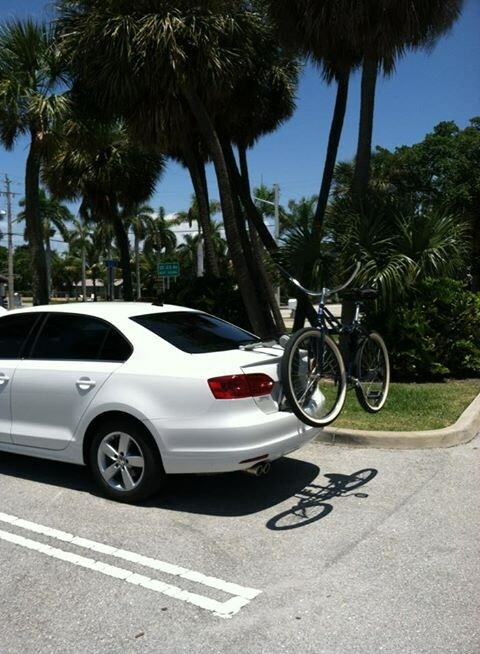 and use a hitch mounted bike rack. I have added a link to the 3 different hitches available for our 2009 Beetle Conv. What mini do u have? I was looking Into buying a rack for my 2011 Mini Cooper hardtop . Any suggestions. Thanks! That was on a 2007 Mini Cooper. 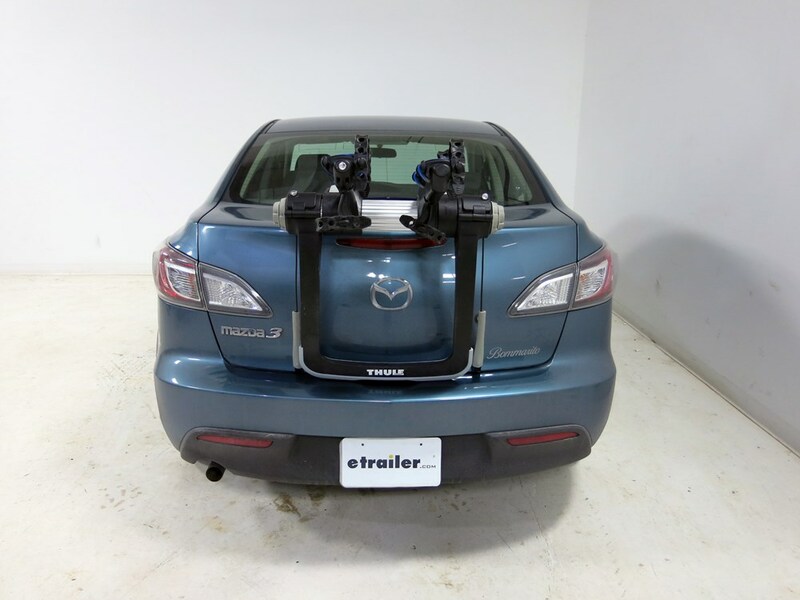 The Thule Raceway 2 and 3 bike carriers are great truck mounted racks. We do cover trunk mounted racks in our Fit Guide. 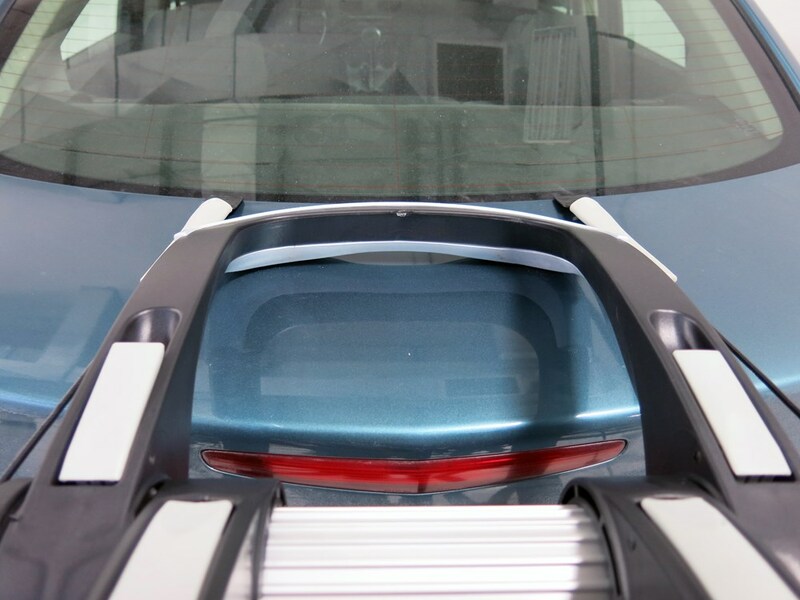 Check out the link below for all the racks that will fit on the rear hatch/trunk of your Mini. I truly like the bike rack: ease of use. It folds up nicely taking little room on a shelf in the garage is a plus. It gets used weekly. It was a good purchase. This is terrific bike rack. 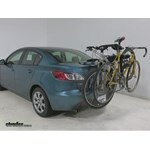 Even folks working at the bike shop think it is so great to have a lockable trunk mount rack. I have gotten the hang of attaching to the back of the car so it only takes a minute. Much easier than trying to get bikes in the roof, which my friends do. I really like you dont have to take the wheel off the bike everyone you want to move it. The rack is super solid. I do highway driving without any concern. With just one bike on the rack Ill put a nylon strap around the front tire and the frame so that the tire doesnt swivel around in the wind. Highly recommended! !